Tell us about your background. When did you become interested in geography? I have been an outdoor person as long as I remember. I love nature and exploring the natural world. I spend a portion of each year in the wilderness hiking, backpacking and mountain climbing. I even make it a point of spending a part of my working day outside and have large windows in my office so that I can see out when I am at my desk writing! I also love reading and teaching God’s Word. It has been my privilege to do that as a pastor, college professor, and author. But it was not until I was in graduate school that my love for the natural world and love for God’s Word came together in a Bible geography class. I have not been the same since. As a writer and field instructor for Jerusalem University College in Israel, I have worked to pass along my passion and insights gained to others. Why do you think so many people gloss over geographical information in the Bible? How can we start paying attention? As moderns, we spend less and less time outdoors and in the natural world. As a result, I believe we are less inclined to notice all the places that the natural world appears in our Bible. What is more, we are quick to read past things like geography we don’t understand. Between the two, most of the Bible’s geography has remained out of sight. However when we begin to actively look for the influence and mention of physical geography (the natural features on the earth’s surface and forces that impact them), natural history (the habitat and habits of plants and animals), and human geography (the human responses to the natural world), we will find precious few pages in our Bible which do not employ geography as God communicates his thoughts with us. What are your favorite geographically enriched passages? There are many. But among my favorites are the familiar Bible verses and stories which include geography that is often overlooked. For example, the story of David and Goliath (1 Samuel 17) is a very well-known Bible story. But the geography in the first three verses which prepare us to read the story and the geography of the closing verses (17:52-53) which summarize the outcome of the event are often ignored despite the fact that they play a key role in telling this story. The geography of the initial verses indicates that a corridor of land critical to the wellbeing and security of Israel had been overrun by the Philistines. This creates a national security crisis which would show the worth of any leader who could effectively address it. When David brings his faith, courage, and intelligence to the battle, this critical corridor of land, once filled with Philistines, is emptied of all but those Philistines who perished in the fight. The geography so often missed brackets the familiar story of David and Goliath, setting up the crisis and highlighting the character of the one who resolved it. Another set of stories in which geography plays an important role is in the feeding of the four and five thousand. Again the details are familiar to many Bible readers, but the geography often goes unnoticed. That is unfortunate because the geography plays a key role in demonstrating these two miracles are not just about food but forgiveness. With both feeding miracles behind him, Jesus urged the disciples to compare them (Matt. 16:5-6). There were three key differences: the number of households fed, the number of baskets collected, and the locations in which they occurred. Location combined with the number of baskets collected combine to reveal an ethnic difference between those blessed by the two miracles. The feeding of the five thousand was set on the north side of the Sea of Galilee in the area largely settled by observant Jews. By contrast, the feeding of the four thousand was set in the Decapolis on the east side of the Sea of Galilee. This was Gentile country. Jesus did exactly the same miracle, one on the north side and one on the east side of the Sea of Galilee, one for Jews and one for Gentiles to make a larger point. The kingdom of God was to be more diverse than most Jewish teachers supposed. The two feeding miracles were about more than food, they were about forgiveness—forgiveness that extended geographically to all sides of the Sea of Galilee. Explain the basis of the atlas in “historical geography” and “literary geography.” Why did you use both in investigating the contents of this atlas? Historical geography is the traditional approach used in Bible atlases. Its goal is to understand how place shapes events in the flow of human history. Because the Bible is full of events, I use historical geography in just that way, to better understand how geography shaped the events mentioned in the Bible. But to that I add literary geography. That is what makes this atlas unique. Who the biblical authors were, how they thought, and how they most naturally communicated was intimately linked to where they were from. It was natural them to use geography when they spoke and wrote, just as it is for us. The Holy Spirit could have overridden this natural penchant to communicate with geography but did not. Consequently there is geography in my Bible! Literary geography asks how the geography used in literature is meant to shape readers. How does it change our perspective? How does it build our faith and shape our trust? Unlike historical geography, literary geography opens a pathway to consider the role of geography in portions of the Bible which are not connected to an event. It considers the role geography plays in shaping the readers of the psalms, the prophetic writings, and the letters of the New Testament. Those are portions of God’s Word which have typically received little attention in a Bible atlas. Literary geography not only expands the atlas into all the literature of the Bible, it also makes the atlas read differently. On most pages, it will sound more like a Bible commentary than a traditional Bible atlas. What do you hope readers will take away from reading the atlas? There is geography in our Bible! 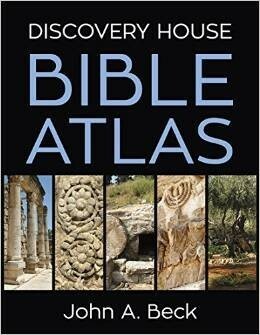 My prayer is that the Lord will use this atlas to help people better understand passages where he has chosen to speak geographically with us. A better understanding of geography is not the only tool we need to read the Bible well. But I am convinced it is a critical tool for Bible readers. We will leave too many passages of Scripture unconsidered and unused if we fail to take into account the geography at work in them.